We fit stunning hair extensions, unrivalled in quality and customer satisfaction. Our aim at Hair Fairy Essex is to provide you with the hair you have always dreamed of, allowing you to express your individuality and refine your own style. Transform thin hair into enviable volume, cropped hair into cascading vivacious locks and dull hair into spellbinding colour. One of the newest, most modern methods on the market. Very popular with celebrities and practiced in top salons all over the world. These Hair Extensions are applied individually, strand by strand along neat partings made throughout your natural hair. Applied using micro rings to create a track in a straight neat line, the weft is then cut to size and sewn along the track of micro rings. Our fully qualified and experienced stylists will cut, blend and style your new hair FREE of charge, creating a gorgeous natural flowing look. Tape extensions are quickly becoming one of the most popular options. Tapes offer a low maintenance, reusable hair extensions solution. 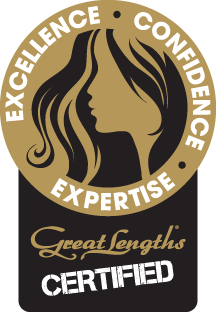 At Hair Fairy Essex we’re proud to be a platinum certified Great Lengths salon. Great Lengths offer some of the highest quality human hair extensions in the industry which is sourced ethically and comes in every colour you could wish. We use Great Lengths hair on many of our clients. View some of our work with Great Lengths in our Gallery.